The new Powerbeats Pro from Beats use technology borrowed from Apple's latest AirPods to create the first Powerbeats without a wire between the two earbuds. 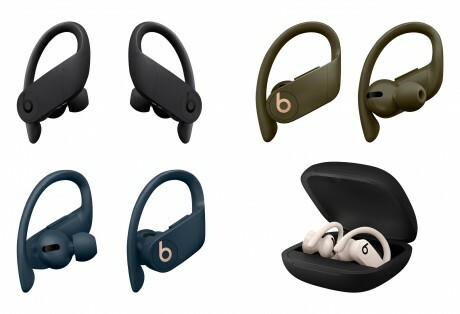 Optimized for workouts, they have redesigned, adjustable rubber loops that hook over the ear like other Powerbeats. Despite being fully wireless, they're 23% smaller and 17% lighter than the Powerbeats3. Like AirPods, they automatically pause when removed from the ear. They also use the same Apple H1 chip as the latest AirPods, which enables them to respond to "Hey Siri" commands. Beam-forming microphones help filter out background noise during calls. Each bud has a full set of identical controls, allowing either one to be used without the other. Beats claims that each bud will last for 9 hours of music, and the included charging case brings that up to 24 hours total. Quick charging provides 1.5 hours of music playback with just five minutes of charging. Powerbeats Pro are compatible with both iOS and Android phones. Apple will sell the Powerbeats Pro in May for $250. They will be available in Black, Navy, Moss, and Ivory. Apple today began accepting orders for its AirPod wireless headphones. The AirPods instantly turn on and connect to nearby iPhones when the carrying case is opened.